Less than one month after she met Tim Sarre, Anya Berger was scheduled to leave Los Angeles to pursue a fashion studies degree in New York City. In the short time they had together, remembers Anya, "We saw each other almost every day of those twenty-five days and had dinner almost every night." 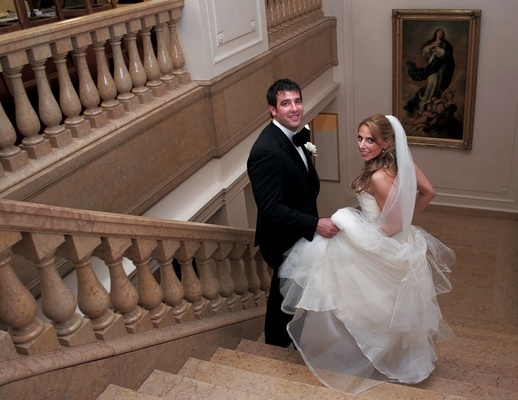 It was difficult for her to leave, but Anya and Tim both knew that their relationship would endure the cross-country distance. Once it became clear that she and Tim were meant to marry, Anya hoped to be engaged by her 28th birthday. She never told Tim her wish, but when her birthday arrived with no sign of a proposal, Anya was dismayed. Hiding her disappointment as best she could, she readied herself for a birthday dinner. Rushing down the hall so they would not be late, Anya encountered Tim waiting for her on bended knee. "I didn't know what was happening, but he got me. He really got me when I least expected it!" says the bride. As the head fashion stylist for Entertainment Tonight and The Insider (Tim is a civil engineer), design and style are Anya's specialties. 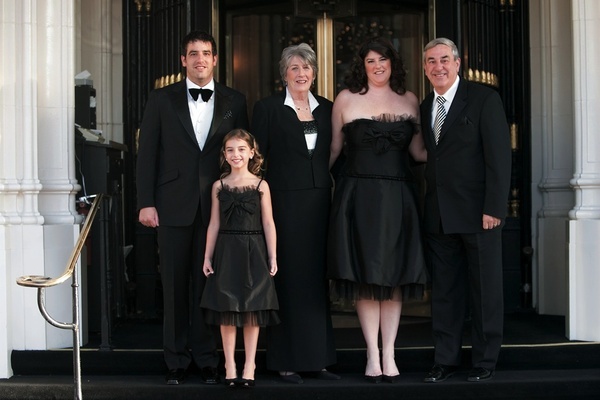 It was only natural that Anya would make sure that every aspect of their celebration from top to bottom -- and head to toe -- was chic, coordinated, and custom-created. 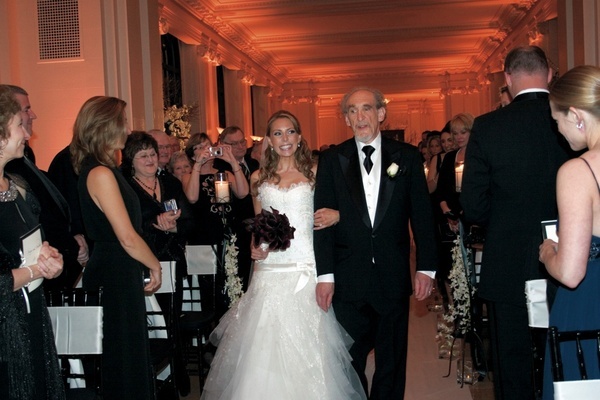 "Nothing was cookie cutter," claims the bride. But it was also important to her that the wedding be warm and inviting. "The balance between the look being very sophisticated and elegant without being uptight was one of my goals," she adds. Using a swatch of black and white striped fabric as their inspiration, Anya and Tim dove into planning their winter wedding with a fine-tuned perspective. 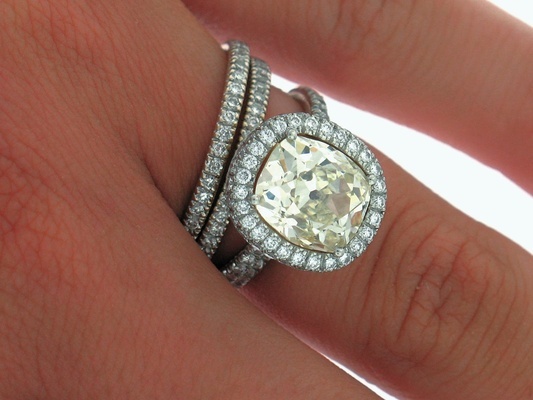 "We wanted everything to be five-star, extremely high quality, and special." 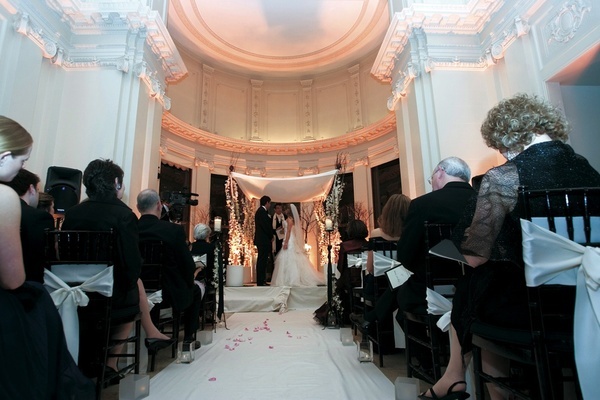 They loved the idea of a New Year's Eve celebration, and scheduled their wedding festivities around the holiday weekend. 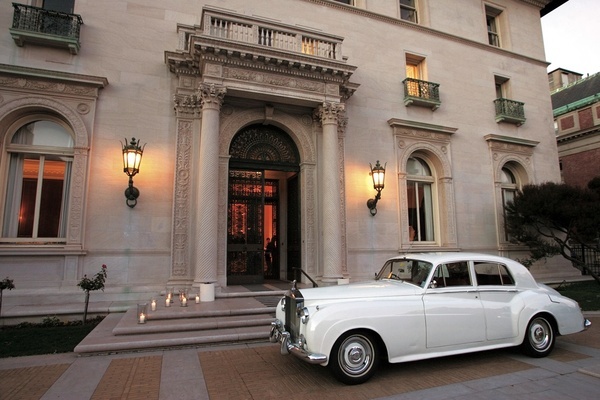 They also fell in love with San Francisco's historic Flood Mansion as a venue because both the city (where Anya grew up) and the mansion's panoramic view of San Francisco Bay made for a very special destination for their many out-of-town guests. 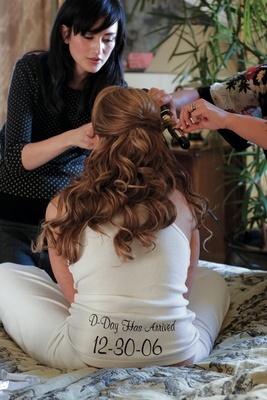 In keeping with her calling, the bride devoted hours to styling the bridal party, which included passionately designing the bridesmaid and flower girl frocks. To go with her bridesmaids' "perfect black party dresses," Anya gifted each lucky lady with the Christian Louboutin shoes of their choice. 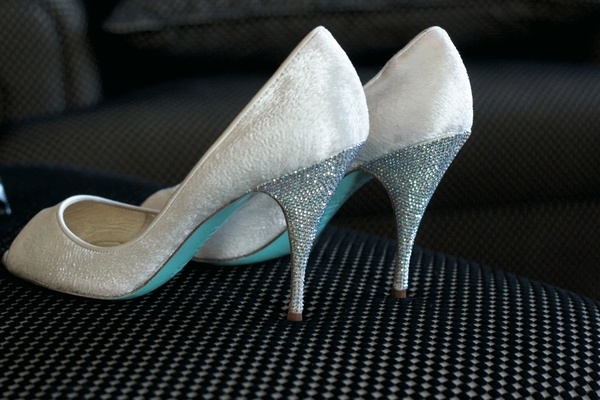 The famous red-soled shoes also coordinated with the bride's own heels: Louboutins, but with symbolic light blue soles instead. Anya commissioned black and white-striped straight ties from Italy for the groomsmen and unearthed an oversized vintage bow tie to go with Tim's bespoke striped tuxedo. The bride's own dress was a strapless tulle and crystal creation by Elie Saab that featured a satin bow at its dropped waist. 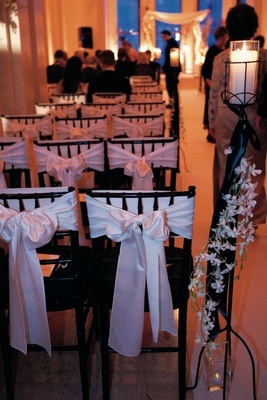 This detail was reflected in the large bows that were tied to each black chiavari chair at the ceremony. 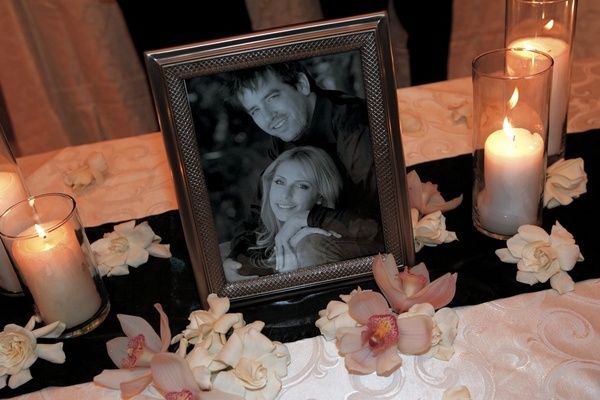 During the proceedings, Anya's brother and Tim's sister each poured a different type of wine into one glass to symbolize the blending of the two families. After the bride and groom drank the wine, their mothers lit a unity candle. Anya and Tim exchanged their vows with one hand placed on the other's heart. 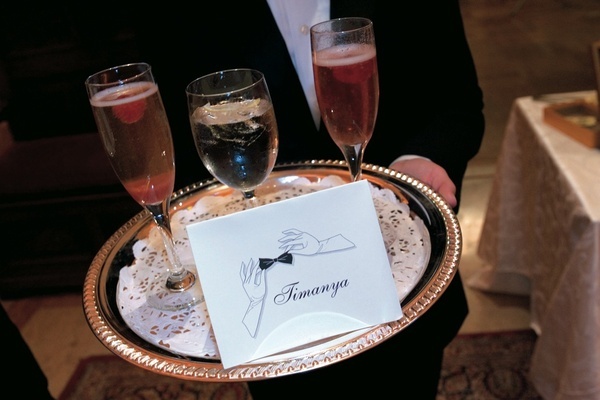 Guests enjoyed signature "Timanya" champagne cocktails as they made their way to the reception. 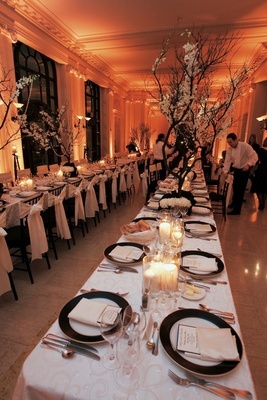 The dining room was styled like a grand dinner party with long feasting tables set with black and white china. 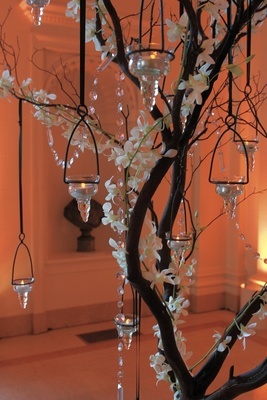 Tall branches strung with crystals, orchids, and floating votives were anchored along the tables in boxes of white mums tied with black ribbons. 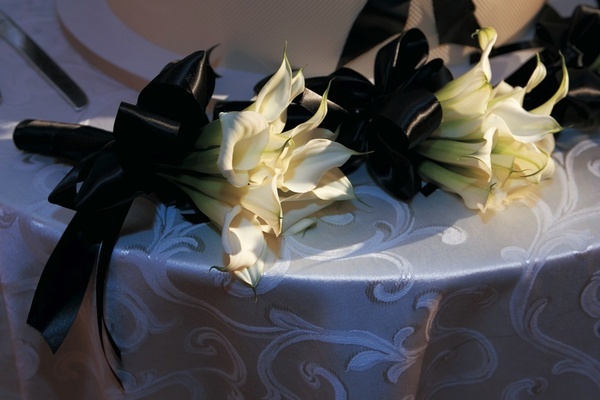 White bow sashes continued to top off each black chair at the reception. 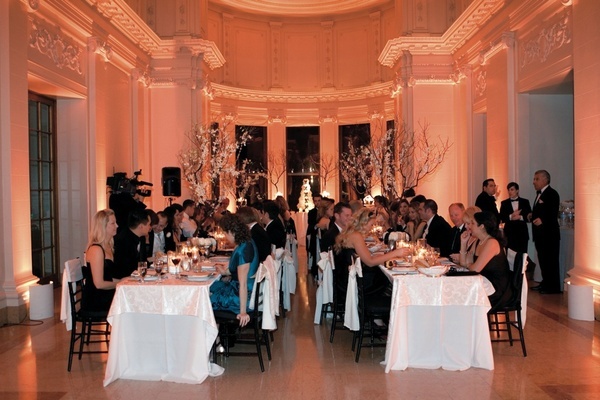 With the candlelight bouncing off the strands of crystals, the expansive room sparkled with winter wonder. 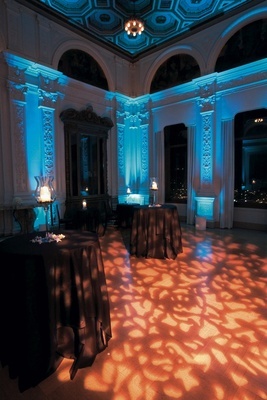 The newlyweds saved their first dance until the end of the evening, after they cut into their spectacular cake. "I told Sam Godfrey [the designer] that I wanted the cake to be bigger than me!" says Anya. 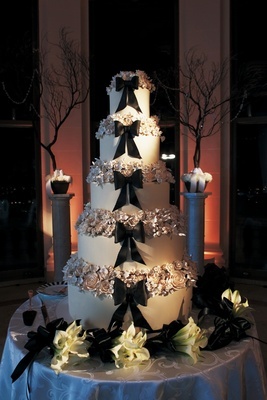 With porcelain-like flowers between each of the five layers, the cake also boasted black fondant bows in keeping with the event's trend. Inside was a specially-made flavor combination of espresso cake brushed with Baileys Irish Cream liqueur and layered with vanilla bean filling. With all of their guests looking on, Anya and Tim took to the floor for an emotional dance to "I Want to Know What Love Is" by Foreigner. 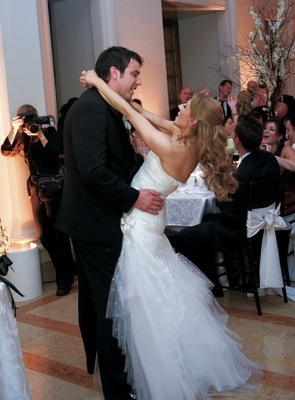 All 150 people were singing along," recalls the bride. "You could feel the energy and the love in the whole room. It was a moment in time that we never wanted to end."